Ongoing publications are noted to present. Click any of the thumbnail images for a higher resolution, full-sized jpeg. Please review our copyright declaration or just contact us if you have any questions regarding any copyright information. See also Other Publications and/or Student Publications. 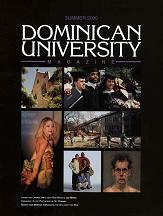 Publication of Dominican University Magazine is bi-annual, and labeled seasonally (i.e. Sping/Summer, and Fall/Winter), with later issues labeled by individual seasons. 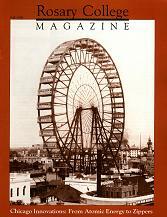 Editions began with the Spring/Summer issue and continue though to today. Publication dates are variable, and the following list hopefully accounts for the inconsistencies. 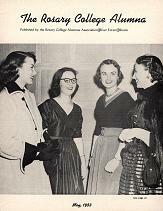 Dominican University Magazine was formerly titled Rosary College Magazine. According to the inaugural issue, For the Record had one purpose — “to inform our friends and patrons of all that concerns Rosary College: interesting campus events, plans for the future, the successes of our graduates, and even the occasional set-backs which occur in the history of any institution.” Issues appeared at “irregular intervals as the need of communicating information arises.” Publication began in February of 1957. It is unknown whether there are any missing issues, or if publication continued after July of 1964. Front Page was a news publication issued by the Office of Institutional Advancement for alumni, parents and friends of Rosary College. Publication was initially on a quarterly basis, designated seasonally (i.e. Autumn, Winter, Spring and Summer). Later editions were biannual and sometimes designated by months, as well. Front Page changed its name to Rosary College Magazine. Not to be confused with the Rosary College student newspaper The Rosarian. Publication of Rosary At Random began in 1943, under the authority of the College Alumni Association. 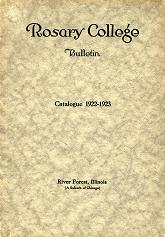 Editions were issued quarterly until 1970, whereafter it was bi-annual. Publication dates were named alternatively by months or by seasons. The following list will hopefully make the naming schedule apparent for each particular cycle. Earlier editions were called Rosary College Alumna. This newsletter was published by the Rosary College Alumnae Association beginning in February 1940, usually twice a year. The Rosary College Alumna was superceded by Rosary At Random by 1968. The Rosary College Bulletin constituted the legally binding contract with incoming undergraduate students. 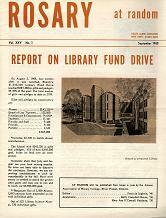 Each issue was published for a college term, often from September of one year until June of the next. Each bulletin provides extensive details about coursework, admissions, academic requirements and financial obligations, as well as a list of faculty, adjunct faculty, administrators and other relevant contact information. Beginning with the 1997 — 1998 Edition, each issue is named the Dominican University Bulletin. The following supplements to the Rosary College Bulletin provide information about Summer Session programs. Issues named Announcement of the Summer Session, Summer Session, and Summer Session Announcement contain information about courses, tuition, admission and registration. The earliest issues also list Officers of Instruction. Issues named Enrollment Summer Session and Enrollment of Students and Summer Session list students by name and by place of origin; information about degrees conferred during the relevent calendar year is also provided. Music The earliest of these Bulletins is labeled Conservatory of Music; all subsequent editions are labeled Music. 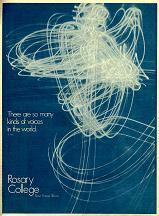 Publication of the Rosary College Magazine was quarterly and began in the Summer of 1987; issues were labeled seasonally, with Summer, Fall, Winter and Spring editions. From 1994 to 1996, publication became bi-annual, still labeled seasonally. Rosary College Magazine became Dominican University Magazine along with our formal institution-wide change of name in May of 1997. One of Dominican University's newest publications, this newsletter is published by the Commuter Student Association. Stars On Wheels is published four times a year. 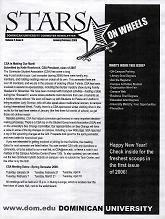 The first issue came out in 2005. Upbeat is published by the Communications Office for the Faculy and Staff of Rosary College/Dominican University. 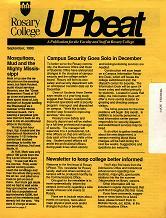 Publication was originally monthly and on paper but, beginning in September of 2004, Upbeat is issued in electronic form. So far, the Archives do not hold electronic copies of Upbeat; we print out a hard copy of every issue. Follow the link to access current editions of Upbeat in .pdf form.